WASHINGTON – The United States Mint (Mint) will begin accepting orders for product options in the 2018 Breast Cancer Awareness Commemorative Coin Program beginning on March 15 at noon Eastern Time (ET). Public Law 114-148—the Breast Cancer Awareness Commemorative Coin Act—authorizes this three-coin program in recognition of America’s fight against breast cancer. The program includes a clad coin, a silver coin, and the Nation’s first-ever gold coin with a pink hue. The table below lists available product options and their prices. Each option comes with the Mint’s customary Certificate of Authenticity. The introductory sales period ends on April 16, 2018, at 3 p.m. ET. At that time, regular pricing will take effect. The Mint prices gold product options according to the range in which they appear on the Mint’s “2018 Pricing of Numismatic Gold, Commemorative Gold, and Platinum Products” table, available here. Coin prices include surcharges of $35 for each gold coin, $10 for each silver coin, and $5 for each half dollar coin. The Mint is authorized to distribute the surcharges—in accordance with the law—to the Breast Cancer Research Foundation to further its efforts in breast cancer research. Public law authorizes the Mint to strike and issue up to 50,000 gold coins, 400,000 silver dollar coins, and 750,000 half dollar coins in proof and uncirculated qualities. Customer demand will determine the ratio of proof to uncirculated coins minted within the authorized mintage limits. 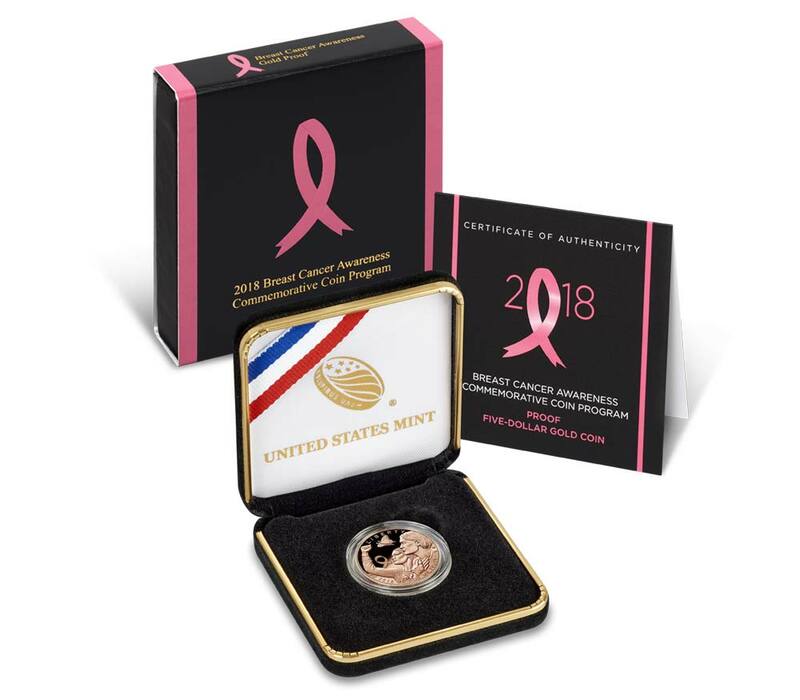 In October 2018, as part of Breast Cancer Awareness Month, the Mint will offer a coin and stamp set featuring the Breast Cancer Awareness Proof Half Dollar and a Breast Cancer Awareness Stamp from the U.S. Postal Service. This product option will be limited to 25,000 units. The Mint will accept orders at catalog.usmint.gov/ 1-800-USA-MINT (872-6468), while hearing- and speech-impaired customers with TTY equipment may order at 1-888-321-MINT. Information about shipping options is available at catalog.usmint.gov/customer-service/shipping.html. The Mint will limit orders for the gold coins to one per household per product option, across all sales channels, including bulk purchases, for the first 24 hours of sales. The Mint will remove the limit at the end of the 24-hour sales period. Damstra’s reverse design features a Tiger Swallowtail butterfly in flight, a symbol of hope. Inscriptions include “UNITED STATES OF AMERICA,” “E PLURIBUS UNUM,” “BREAST CANCER AWARENESS,” and the respective denomination of each coin: “FIVE DOLLARS” for the pink-hued gold coin, “ONE DOLLAR” for the silver coin, and “HALF DOLLAR” for the clad coin.